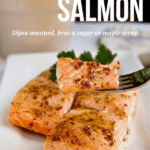 Roasted salmon glazed two ways ~ with brown sugar and Dijon mustard or with maple syrup and whole grain Dijon mustard. Either way is delicious, super easy and dinner is on the table in under 30 minutes. My kind of weeknight dinner! People either love salmon or hate salmon. Our house is divided. Now that the haters are gone (at college), I can make salmon more often and not worry about the cringing faces and gagging. I think that a lot of people who don’t like salmon haven’t had good salmon. Not so good salmon is well, not very good. I once had salmon in a really nice restaurant and it was so fishy and strong that I couldn’t eat it. The waiter told me that since it was wild salmon, it tasted the way it did because of what the salmon ate. I don’t think he was right. I think I got some bad salmon, case closed. I have been making salmon at least once a week and sometimes twice a week. I almost always just make a simple glaze and roast it in the oven. So, so easy. Either maple syrup and mustard or brown sugar and mustard. How easy is that? And it is just delicious on good salmon. I’m back to the quality of the salmon. First, don’t be afraid to make this at home. Fish doesn’t have to be hard to cook or in any way intimidating. Second, get the best salmon you can afford. I say that because my favorite salmon is King salmon. At roughly $25 a pound, I can’t really afford it unless it’s on sale big time. 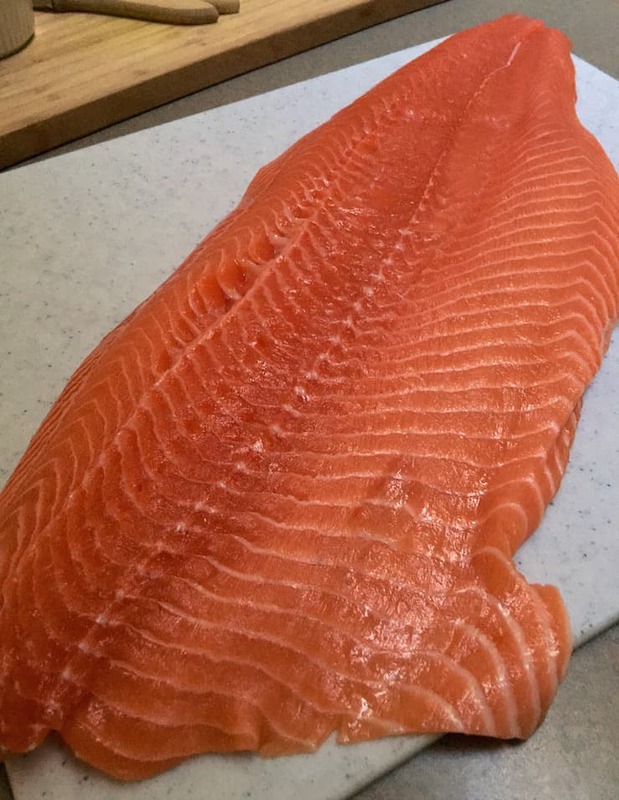 I have a couple of places I really like for seafood and I try and get antibiotic-free farmed salmon. But I do get wild caught when I can find and afford it. Back to the glazes. Both are really good. 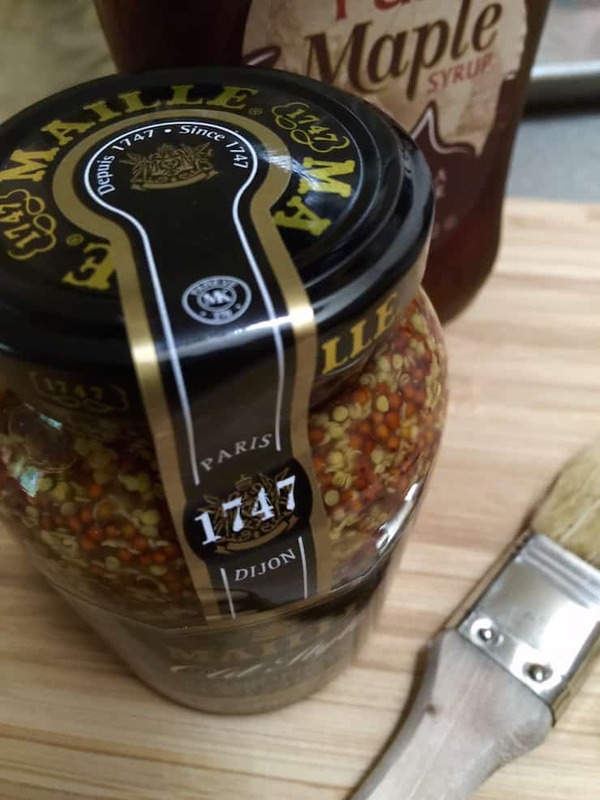 The maple syrup and mustard uses coarse ground dijon and the brown sugar and mustard uses regular dijon. The maple syrup glaze is a little milder and sweeter than the brown sugar glaze. 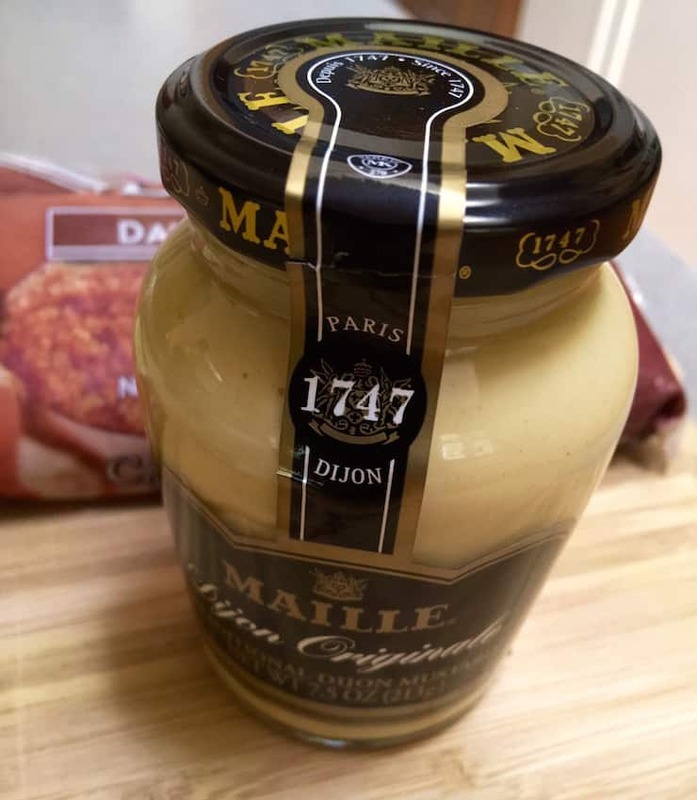 I love dijon and use Maille brand which has a kick to it. Since these glazes only have two ingredients, quality matters. You might also like my Tilapia Piccata or Cajun Brown Sugar Salmon, both easy and tasty seafood dinners for busy weeknights. 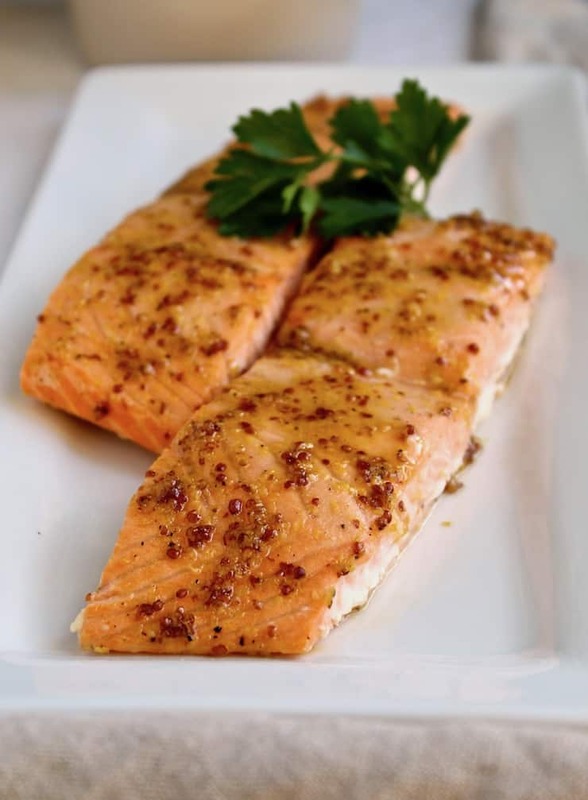 If you’ve tried this Roasted Glazed Salmon or any other recipe on the blog, then don’t forget to rate the recipe and let me know how yours turned out in the comments below ~ I love hearing from you! HUNGRY FOR MORE? Subscribe to The Hungry Bluebird Newsletter for a weekly email of new content and follow along on FACEBOOK, TWITTER, INSTAGRAM and PINTEREST. 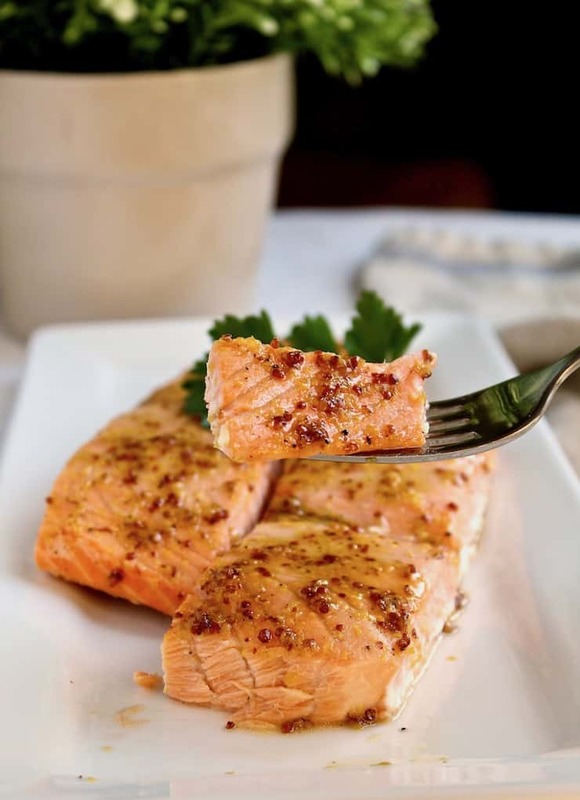 Easy glazed salmon roasted in the oven, with brown sugar and Dijon mustard or maple syrup and whole grain Dijon mustard. Either way is delicious and on the table in under 30 minutes. In a small bowl, mix the glaze of your choice. Use the measurements given or adjust to your taste, whatever ratio of spicy-sweet you like. 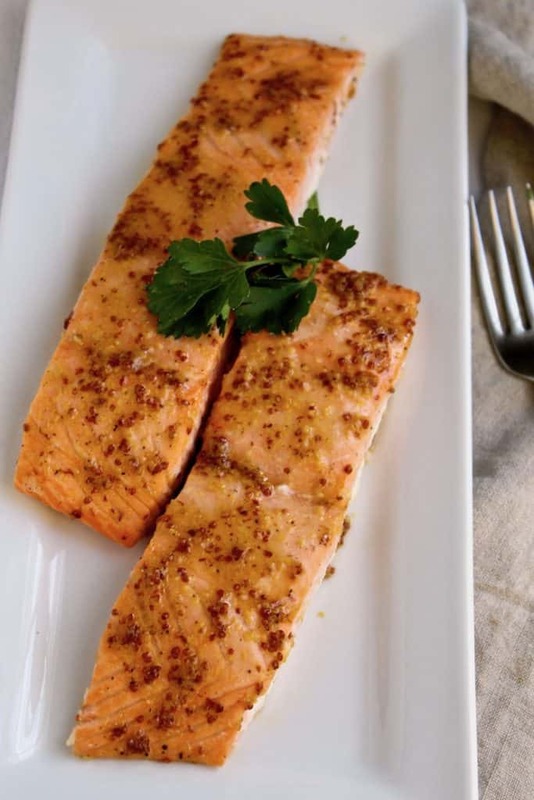 Arrange salmon on a foil-lined baking sheet. Season with salt and pepper. Brush or spoon glaze all over the salmon. Bake in oven for about 12 minutes. Let salmon rest for about 5 minutes, loosely tented with foil, then serve. If you used salmon with the skin, when you serve it, use a spatula and remove just the fish and leave the skin on the pan. It should come off very easily. It doesn’t get any better, or easier, than this!